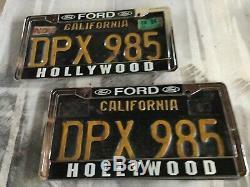 Hollywood Ford was owned by Ben Alexander the actor from the TV series Dragnet. These frames are in excellent condition. These plates can use a good cleaning or have restored to show condition. The item "California license black plates with frames" is in sale since Thursday, March 7, 2019. This item is in the category "Collectibles\Transportation\Automobilia\License Plates\US\ California". The seller is "adtom1" and is located in Concord, California. This item can be shipped to United States.